Divide your training time into two 100 hours modules for a more flexible way to learn! 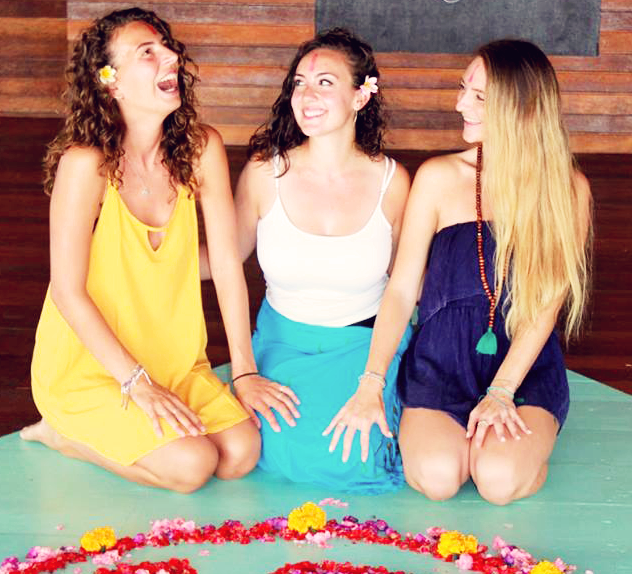 With our Yoga Alliance Accredited RYT-200 Yoga Teacher Trainings in Tropical Bali. As yogis, we are very flexible – we are happy to work with you to create a training schedule that best meets your needs. Contact us to arrange a tailored training schedule with our Level 1 Yoga Teacher Training 200 Hour Part Time Program. Santosha’s part-time teacher training allows students to complete their 200 hour teaching certification by attending two separate 12 day trainings at any two Santosha Level 1 YTT 200 courses anywhere in the world. By completing the full 200 training hours in person, you will be eligible for Yoga Alliance Qualification at the RYT200 Level. The part-time YTT option is our way of making yoga teacher trainings more accessible for those with time or budget restraints. You will enroll in Part A by selecting a Level 1 YTT 200 course date for which you are available to attend the first one or two weeks. Upon completion of Part A, you will enroll in Part B by completing the remainder of your training during the final weeks of a separate Level 1 YTT 200 course. You must attend the full 200 contact hours (not online hours) divided over the two events – Yoga Alliance requires these hours to be in-person for your 200 hr certification. Online study hours are not counted towards certification by Yoga Alliance. Santosha is dedicated to helping you reach your dream by offering this option with as much flexibility as possible! Please Contact Us to arrange your Part Time Teacher Training schedule. Can I mix and match online and in-person hours? If you are wanting a Yoga Alliance Qualification in recognition of your study, then you cannot mix online and in-person hours – you will need to complete the whole 200 hours in-person on the training as Yoga Alliance do not count online hours towards their certifications. How do I sign up for your Part Time Level 1 training? If you wish to do this enroll via the website for the training you wish to do first, and then email us and let us know the second training you plan on attending. You can book your first training (Part A) here. Santosha’s 200 Hour Yoga Teacher Training certification is one of the most comprehensive yoga teacher trainings in the world. Through our practical curriculum, we create a foundation for teaching yoga skillfully and effectively. Our Yoga Alliance Certified RYT-200 Hour training qualifies you to teach in both Australia and all over the world. We embrace a holistic approach to the path of yoga, combining the wisdom of traditional yoga with contemporary understandings of the body. The yoga taught is not another ‘style’ of Yoga but draws from the healing traditions of the Sri T Krishnamacharya lineage. Santosha’s teachers possess deep knowledge, and their passion for teaching means that they teach from the heart. Students and teachers create an accepting environment for learning and transformation; a soul tribe from all over the world that support each other to reach their true potential. Join the thousands of Santosha graduates who have changed their lives, make life-long friends and experience the unforgettable joy of becoming a yoga teacher. If your desire is to teach, the training will provide you with the knowledge and confidence to lead classes and workshops. You will gain the skills to teach safe and engaging classes to share your love of yoga with the world. 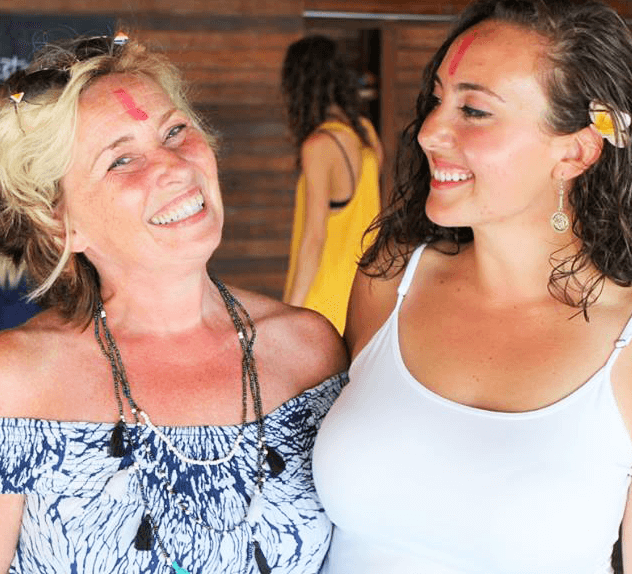 For all students, this training provides an incredible opportunity to connect to your true nature, embrace new relationships and acquire tools to empower you to move through life with greater joy, passion and ease… all while being fully supported by a like-minded group of yogis and new friends. 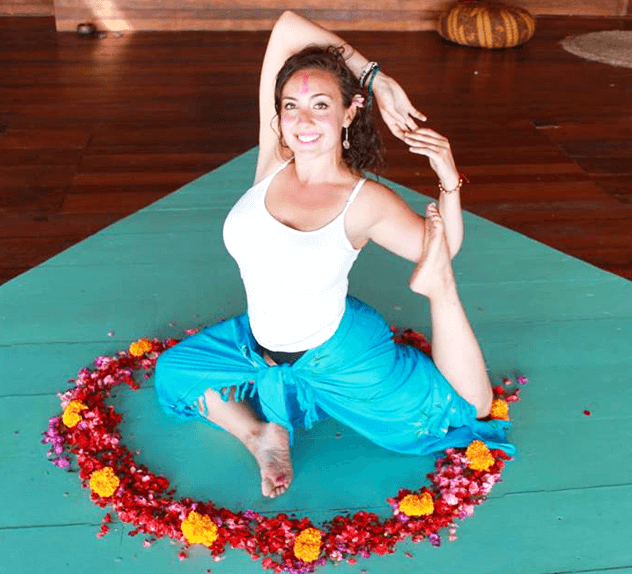 The Santosha RYT-200-hour Yoga Teacher Training allows you to experience the true essence of yoga. The physical yoga (Asana) we teach is a flowing vinyasa style which builds traditional hatha postures together in short flowing sequences. It is accessible for all levels and can be modified when needed or advanced when a stronger practice is appropriate. Gain knowledge of anatomy specific guidelines which form a solid basis for safe and informed teaching. We provide comprehensive Asana modules and a manual with all you need to teach and progress each pose. Teach postures and practices safely with correct alignment modifications, adjustments and cues. Once this is mastered move on to sequence safely and effectively, to progress asanas and breath. Explore in-depth the wisdom of yoga philosophy and the Eight Limbs of Yoga, allowing for a deeper experience of the benefits of Yoga and true transformation in your life. Leave with life-changing tools for living and relating. A Teacher’s self practice is the building block from which great teaching begins – leave with a tailored practice, specifically designed for your body, mind and spirit. Yoga Alliance is the world’s largest and widely recognized standards-setting organization for Yoga teachers in the world. You can join up upon graduation at the RYT-200 Level. Upon completing this course, you will be equipped to practice safely and teach others in a range of diverse settings. This course allows you to become registered with Yoga Alliance – the world’s most respected yoga certifying authority – at the RYT-200 Level. Santosha graduates are offered support on their teaching journey. We guarantee you will leave us with a wealth of knowledge, a new qualification, a smile on your face and a warm, open heart! Includes a Santosha Welcome Pack with singlet and tote bag. Please note – Prices include a $350 AUD non-refundable deposit to secure your place. Prices do not include flights, meals or accommodation. If you will be doing the course in two parts, enroll via the website for the training you wish to do first(Part A), and then email us and let us know the second training you plan on attending (Part B). For more information Contact Us. A Yoga Teacher Training is one of the most incredible adventures you will have in your life, so our goal is to ensure that you dive into this adventure on one of the most beautiful locations on earth! Connect to the ocean and the magic of our island home- Yoga Village Nusa Lembongan. 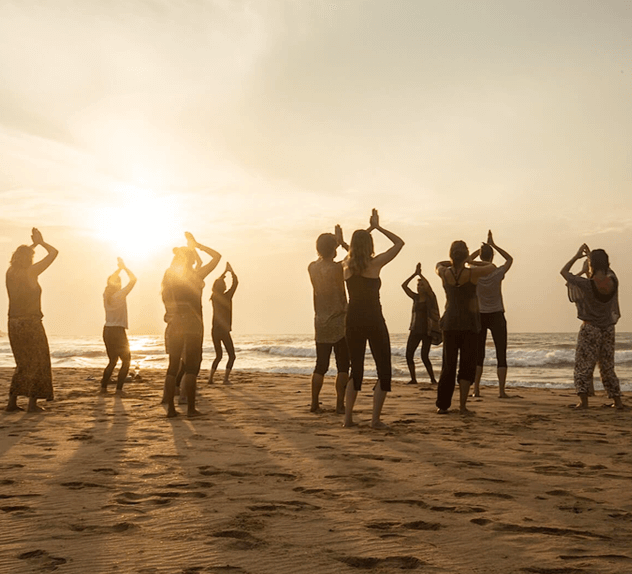 Live as part of a community filled with passion – for surfing, yoga, food, health and well-being… or simply living in an authentic heart-connected way. Getting to Paradise has never been easier! Travel to the island is quick and simple. The boat ride is only 30 minutes from Sanur, Bali. You can arrive at the airport, be picked up and taken directly to the boat and be relaxing on the island with a fresh juice before you even know it! 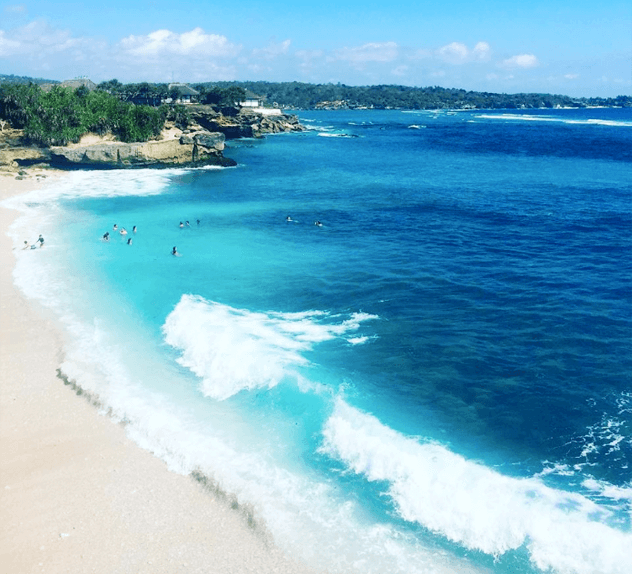 The surf on Nusa Lembongan is a surfers’ dream and you can literally leave our shala and walk a few short steps into clean turquoise waters. The accommodation we recommend is all within 1 – 10 minutes walking, which means you do not need to drive or hire a bike – giving you far more time to surf, swim and enjoy your chilled out island home. Healthy snacks and juices are available all day during your Yoga Teacher Training. Ginger & Jamu have packages available for all types of dietary needs – if you have allergies, are wanting to detox, or just make healthy changes our talented chef Jamie will find the best way to cater for you. Sip a fresh latte or a cool juice while watching the ocean and soaking up the fun community vibe, it’s all right there for you to enjoy. Our Shala is directly in front of the clear aqua ocean, with gentle ocean breezes sifting through continually and sparkling sea views – making it the perfect backdrop for a restorative Yin Yoga practice. 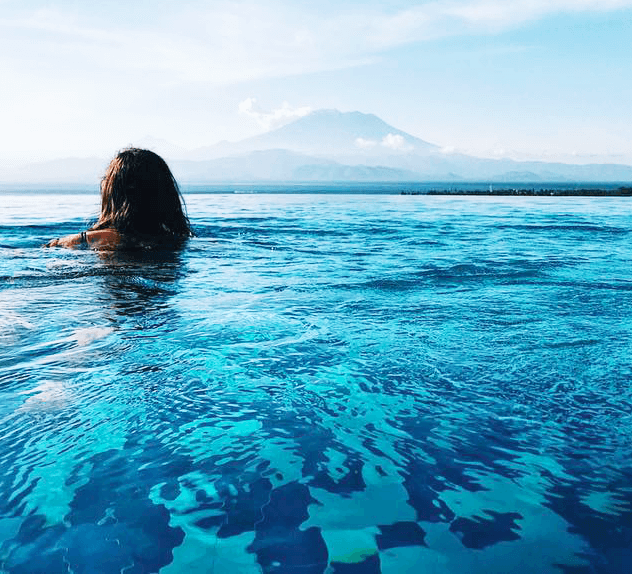 This region is the gateway to many other popular sites and locations, and many stud​ents ​stay on after their immersive to soak up more island vibes or travel to the neighbouring islands such as Nusa Penida or Lombok. Hike volcanos, explore world-class dive sites and create more fun-filled memories with your new Santosha Yoga family. Visit our Nusa Lembongan Location Page to find out more about our island location. 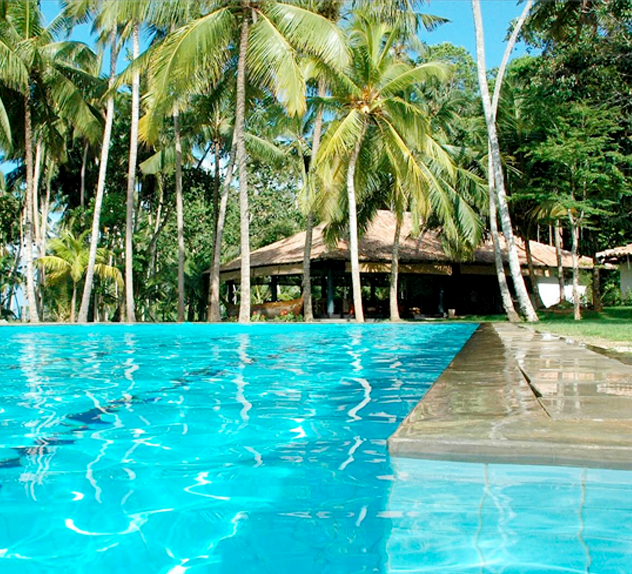 Or Enquire Now to receive instant access to our Nusa Lembongan Accommodation Guide. 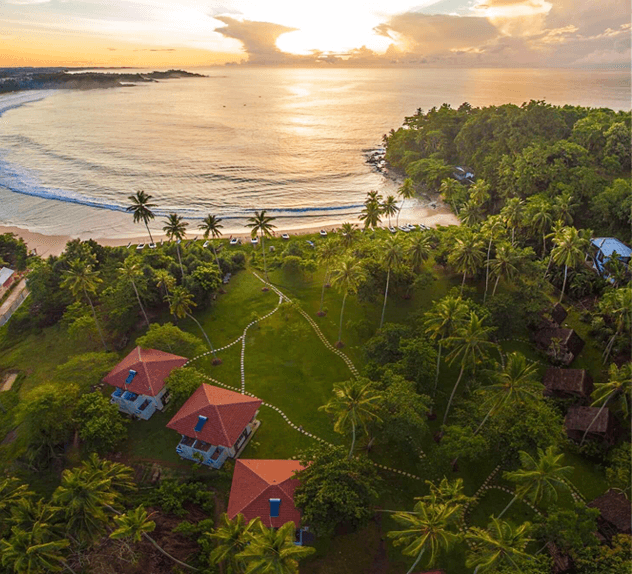 Special 2019 Training – Sumptuous Sri Lanka! We are so excited to be teaming up with Talalla Retreat Centre in Sri Lanka for this very special training. Experience the luxury of a beach-side resort centre, surf and explore this incredible country while transforming your life on our Level 1 Training. 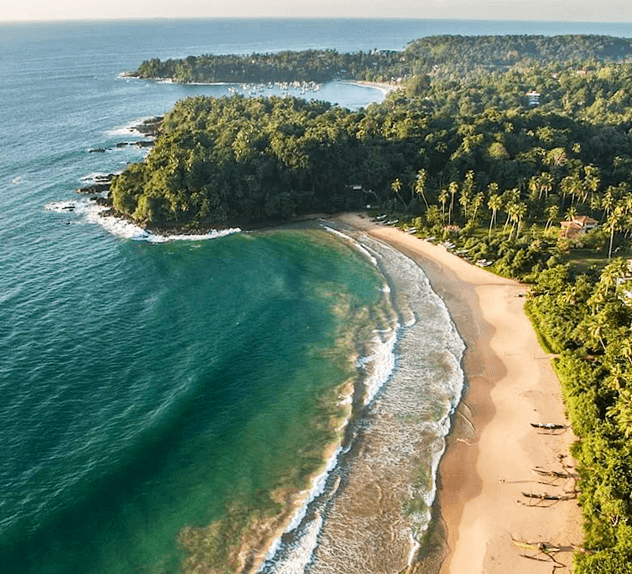 Unspoiled Sri Lanka, with its endless pristine beaches, luscious rain-forests, colorful temples and perfect opportunities for surf, sea and sun is a country you need to experience to believe! Voted Lonely Planets Top 2019 Travel Destination! Sri Lanka is a hidden gem; an alluring land filled with natural beauty, culture and uncrowded beaches and waves. Discover this dream destination for ocean, culture and nature lovers – before everyone else does! From visiting breathtaking ancient temples, exploring wild jungles and exotic wildlife to being blown away by the sun setting over miles of uninterrupted beaches – Sri Lanka will enthrall and enchant you many times over. 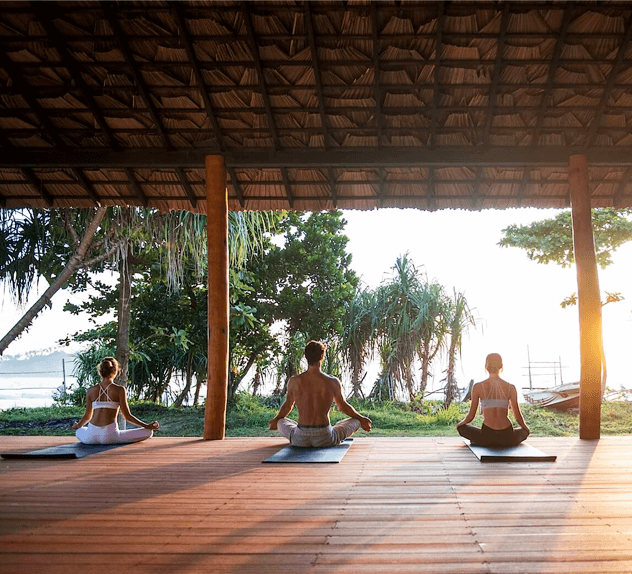 Imagine the opportunity to transform your life and career with a Santosha Yoga Teacher training, surrounded by natural beauty, surf and the lush garden setting of our Sri Lankan venue – Talalla Retreat Centre. Talalla is located within easy access of year-round waves and enough pristine uncrowded coastline to impress any beach-lover. Make the most of the Special Santosha rates at the luxurious beachfront resort Talalla Retreat on your stay – and enjoy luxury resort living at hostel prices. 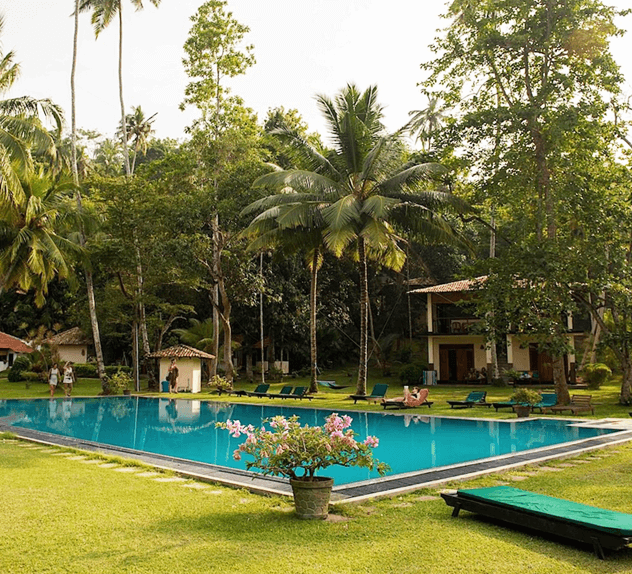 Bliss out by the pool, visit the Ayurvedic Spa, hit the beach or just soak up the ambience of this incredible location. We know visiting a new place can be a little daunting on your own – which is why we have teamed up with Talalla Retreat Centre. In one step they will not only book your room in their gorgeous beachside retreat centre – but also arrange return pick up and drop off to the airport, meaning your travel to the training will be effortless ans stress-free. Visit our Sri Lanka Location Page to find out more about this island jewel. Or Enquire Now to receive instant access to our Sri Lanka Accommodation Guide. Remaining payment due 7 days prior. Check today’s exchange rate to calculate your local currency. Please note – total price includes a $350 AUD non-refundable deposit to secure your place. Please contact us via the form below to receive the ‘Practical Information’ package for further details about our courses and locations. Santosha Yoga and its teachers honour every one of its students as individuals, deserving of receiving the best quality experience possible. Our Yoga Teacher Trainings will uphold a standard of excellence and devotion to the practise while respecting individual needs. We are committed to creating a space of safety and respect that will acknowledge and allow each individual’s innate equanimity, truth, empathy and joy to grow through the process of learning. May all who pass through our courses feel a renewed sense of ease, vitality and enthusiasm for life. May you be blessed with health, compassion and love, and always be free of suffering. I want to be a yoga teacher - is this course for me? Yes, this is the one for you! Our Santosha Level 1 training is fully registered with Yoga Alliance, meaning upon graduation you can immediately sign up to the most trusted and recognised Yoga Teaching organisation in the world, allowing you to teach in studios and gyms all over the globe. I don't want to be a yoga teacher - is this course for me? Our Santosha courses are more than just teacher trainings, they are a chance to transform and grow. Even if teaching is not your goal, you will dive deeper into your own practice, share a unique transformational experience and be supported by open-hearted and caring teachers and friends. So yes, if you want to transform your mind, your body and your life then this course is for you! 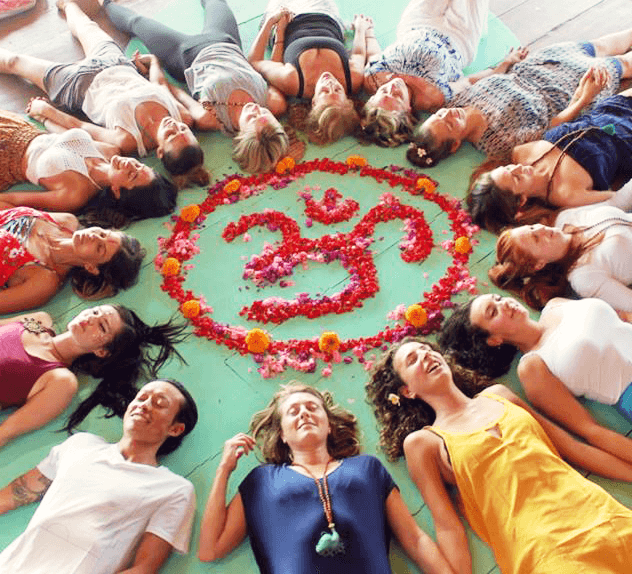 What is the cost of the Santosha Level 1 200 hour Yoga Teacher Training? The cost of our training is AUD $2,990 (or AUD $2,790 early bird discount if you pay in full two months early) This includes your tuition and certificate, but does not cover flights, food and accommodation. How much is that in US dollars/ my local currency? If you are used to US dollars, our course investment converts to approximately $2,150 US (or $2,000 US early bird - paid in full two months early). This makes our course one the most affordable on the market - we want to spread the joy of yoga, so are committed to ensuring the cost is as low as it can be while still providing a top quality training for our students. How much do I need to hold my place? You can enroll with a $350 AU (approx $250 US) deposit. The remainder of the payment is due on week before your training will begin. You can also opt for a payment plan of 5 fortnightly installments. When does the earlybird discount expire? For any course the earlybird discount expires two months before the course start date - so it depends on which course you wish to join. The earlybird applies to the full payment only not the deposit. You must pay in full two months before your course begins to receive the savings. We will be holding our 2019 courses on the chilled out island of Nusa Lembongan, Bali, with one special training in Sri Lanka. Check our Upcoming Dates Page to see which course is the right for you. 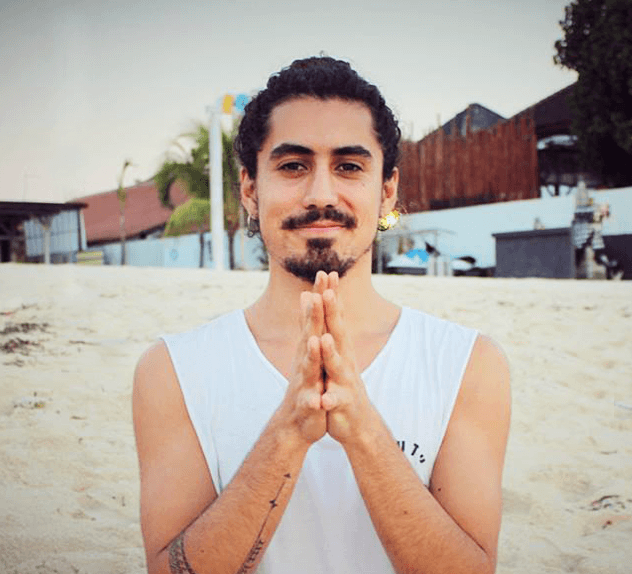 Will I be accepted into the Santosha Level 1 RYT-200 Yoga Teacher Training? Yes, we believe that all people are deserving of changing their lives. Subsequently, the only prerequisite is a sincere desire in your heart to change not only your life, but the lives of others and to fully dedicate yourself during the full 25 days of the training. How proficient at yoga do you have to be to join the Santosha Level 1 RYT-200 Yoga Teacher Training? During the Level 1 RYT-200 Yoga Teacher Training program you will have asana practice every morning, and again in the afternoon. We recommend that students have some form of an asana practice and are relatively comfortable practicing daily. If you have just taken up yoga you may need to give yourself a few months practice in order to benefit from the training. That said, if you have a regular yoga practice you may be more ready than you think. An advanced practitioner is not necessarily a person who can move deeply into advanced postures; an advanced practitioner is someone who comes to the mat with a level of maturity, a willingness to learn and an understanding of the limits of their own body. Keep in mind that this program is not only for aspiring teachers but for people who want to deepen their practice. For those who are looking to teach we do suggest some form of regular practice and asana knowledge, so you may be able to get more from the training. However, for both students wishing to seek a deeper understanding and take their practice to a more advanced level or for those who wish to teach, there are no pre-requisites for this course. I have been practicing yoga for a long time, will this course be suitable for me? A long time practice is a wonderful aspect that will serve you well during the Yoga Teacher Training but it doesn't mean that you have to be an experienced Yogi to do a YTT - or that as an experienced Yogi, you will not learn anything new! You will be taught how to teach Yoga authentically as it was supposed to be taught, taught how to modify and adapt poses to suit your students individual needs, how to use the breath appropriately and much more. Your own practice will expand in a beautiful way! Once I have completed my Level One Training am I eligible for registration with Yoga Alliance? If you wish to register with an alternative Yoga organisation after graduation, please check with this body prior to signing up for the course that our RYT-200 course will be eligible for registration with them. Do we get any time off during the training? NOTE: From August 2019 our courses will run over 24 Days and have 3 days off. How long in the Level 1 200 hour training? The course runs over 25 days, including four days off. This is a guide only – training times can change to meet the needs of that month. The days are long - as we need to fit the required hours for a Yoga Alliance RTY-200 into 25 days. 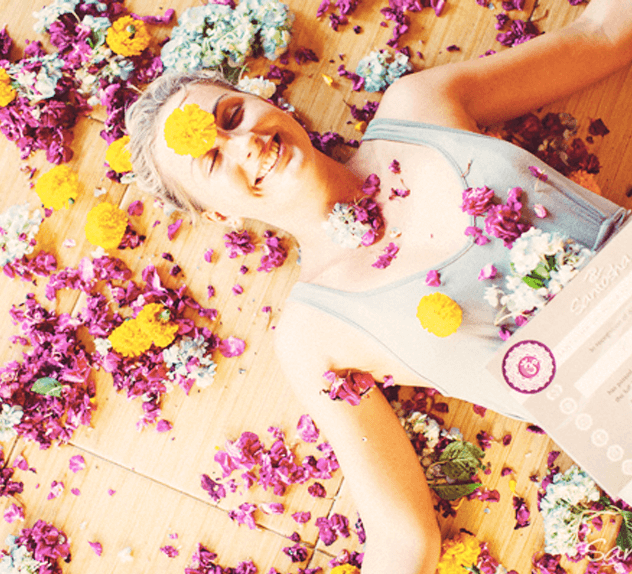 What experience/qualifications do you need for the Level 1 Yoga Instructor class? A passion for yoga and a desire to transform your life for the better is all you need to join us on our Level 1 Training. Over the intensive we will teach you everything you need to safely and effectively teach yoga to others along, with tools for happier, more authentic heart-centered living. I am fairly new to yoga. Will I be able to attend the training? As the course is not purely asana (physical postures) based it does not matter if you do not have an advanced practice. You will be learning much more than just the asana postures. All we ask for a Santosha student is an open mind and heart and willingness commit yourself completely to study and attend all classes throughout the 24 days of your training. I'm not super flexible, can I still join up? Our philosophy is that there is no "one size fits all yoga". Yoga should fit your body, not the other way around. So some people may never get into particular postures, but if they are working with attention and intention they are practicing yoga whether or not they can form every shape perfectly with their body. I have been injured, can I even be a yoga teacher? You do not need to have the perfect, injury free body to be a yoga teacher. If there are postures you cannot demonstrate in a class you can honestly explain to your students the reasons why and get a class member to demo the posture for you if needed, or work off verbal cues. We actually find that teachers who have had issues themselves with their bodies are far better at being aware of student's limitations and keeping them safe, as they are conscious of the care needed to look after an injury or area with limited flexibility or mobility. So instead of thinking of your injuries as a hindrance to teaching and participating in the course, realise that they can be an asset to your awareness and understanding as a teacher. Who are the Teachers on a Santosha Yoga Training? You can meet our experienced team of authentic, passionate teachers here. How do I know who is teaching on the course I choose ? If you are wanting to train with a specific teacher please email to attain the teachers for the training you wish to attend. What books do I need to buy for the training? These can be purchased as books, or electronic downloads for kindle etc. The Power of Now can also be purchased as an audiobook. Yes, once you enrol in the training you will be sent access to a Resource Centre with all the course materials - including our Course Manuals - you will need for the training. You have the choice of downloading or printing these items to use during the course and beyond. I don't have access to a printer and am not bringing a device to download the manuals onto. What do I do? We can order printed manuals for you from a printer in Bali for $60 AUD. An email will be sent out about this with the Manuals one week before the training begins - please reply then and let us know you would like to order these and we will arrange for you. I can't get the full time off work, is there any way I can still do the training? We understand that not everyone can enjoy a 25 day break from their everyday life (though we do highly recommend it if you can!) With this in mind we have designed our Level 1 course to be able to be completed in several parts, for those that are unable to commit to the full training in one go. Generally our part-time students do half of one training, then complete their studies at a second training later in the year. Please get in touch directly with us at santoshayogayttoffice@gmail.com if you are considering this option. I’m pregnant, can I still attend the course? It is possible to complete the course while pregnant, but we ask that the decision is made only with the consultation and full support of your doctor. Only they can advise if this is the best course of action for you. All pregnant students must provide medical clearance via a medical certificate on the first day of the training and email Santosha upon enrollment to formulate an individual pregnancy plan to best keep you (and baby!) safe and comfortable during your time with Santosha. You must keep teachers advised of any physical ailments or issues arising from your pregnancy, so they can best assist and support you when needed. I would like to hear what past students thought of the course, is that possible? Yes, you can visit our What Others Say page to see what other Santosha Graduates experienced on our course! I feel a bit nervous about doing this course. Should I still do it? Yes! This probably means you are ready to step into something new but you just need that extra bit of courage to make the next brave step. You are welcome to write to us and let us know about this and we can happily provide extra support - both before and during your time with us on the course. 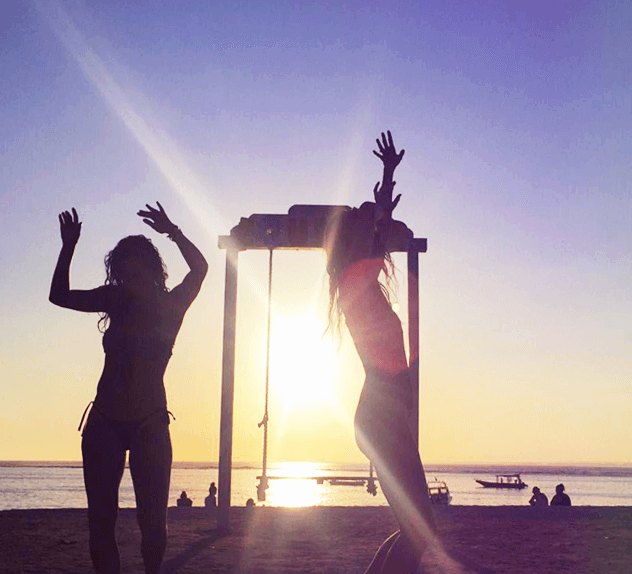 Where are your Bali trainings held? 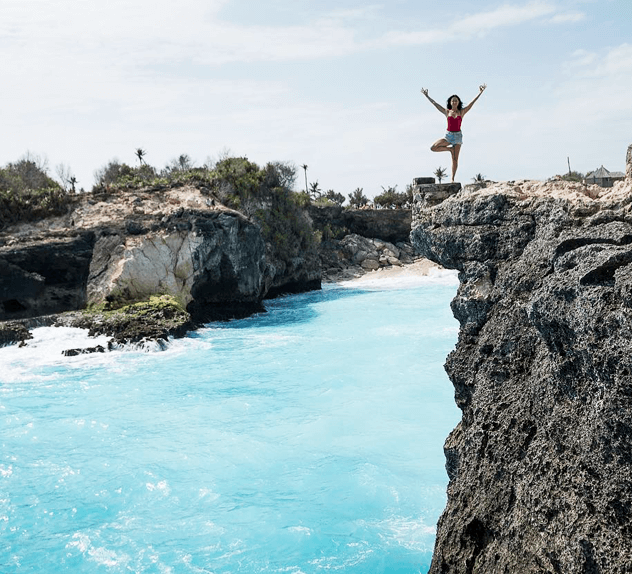 In 2019 we are holding our courses on the chilled out island of Nusa Lembongan, Bali, with one special training in Sri Lanka. Can I stay onsite at the training venue? Yes, there is the option to stay onsite at Nusa Lembongan at Agungs Bungalows. This is a great way to be part of a genuine yoga community (and it means you can sleep in later!) 'Enquire Now' to see our Nusa Lembongan Accommodation Guide with more details. Can I stay offsite at the training venue? Of course! We provide recommended guesthouses nearby our training venues, or you can make your own plans using sites such as airbnb, trip advisor or booking.com. 'Enquire Now' and we will send you our Accommodation Guide, with recommended options to suit all budgets. Is the hotel stay included in the total price? No. We keep these separate at allow our yogis to make the best accommodation choice for their budget and needs. Can I email Santosha to arrange accommodation? How much is accommodation for the 25 days? This depends on the choice of accommodation. You can stay onsite at our training venues, or make your own accommodation plans off-site in the local village. We can recommend options for you if you do wish to stay offsite. - For those on a budget, there are off-site options from $25 AU per night - 25 nights approx $625 AU. - Nice mid-range off-site options can be found for around $30 - $40 AU p/n - 25 nights approx $750 - $1,000 AU. - More luxurious off-site options can be found from $50 AU p/n - 25 nights approx $1,250 AU. * Please note the above are approximate estimates only. Please contact our recommended accommodation providers for an exact quote for your stay. How much is food during the training? There are many great food options in the area and how much you spend will depend where you choose to eat. Local “warungs” can cost between Indonesian Rupiah 10.000 - 30.000 (approx. AUD $1 - $3) a meal; western style establishments will be around IDR 50.000 - 100.000 (approx. AUD $5 - $10). * Please note the above are approximate estimates only. I need a daily coffee! Is that possible? I am vegan/ gluten intolerant/ other. Will I be okay? Yes, at our onsite cafe Ginger+ Jamu great care is taken to cater to those with specific dietary needs. Ginger & Jamu has a wide range of raw, vegan and gluten free options. No, please bring your own refillable water bottle for drinking and brushing teeth. There is filtered water available for a small cost from cafes including Ginger and Jamu - if you bring a refillable water bottle this can be filled everyday and avoid the use of plastic single use water bottles. What airport do I fly into for my training? The airport for Nusa Lembongan and Canggu is Ngurah Rai International Airport, Denpasar, Bali. For Nusa Lembongan, you can easily arrange a pick up from the airport, which will include the 30 minute fast boat across to the island. Please "Enquire Now" for the Accommodation Guide for Nusa Lembongan, which has more details. What is the currency for Bali? Bali is located very near to the equator, therefore its warm, tropical climate makes it a huge draw for tourists. Average year-round temperature stands at around 30°C with a humidity level of about 85%. 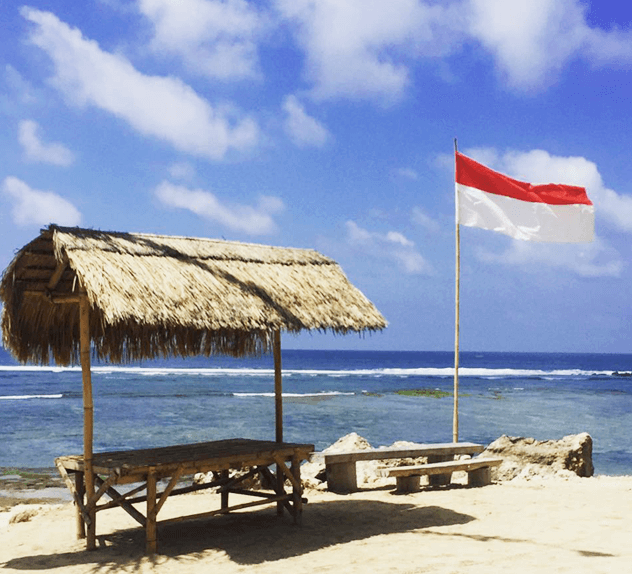 What Visa is required to enter Bali? 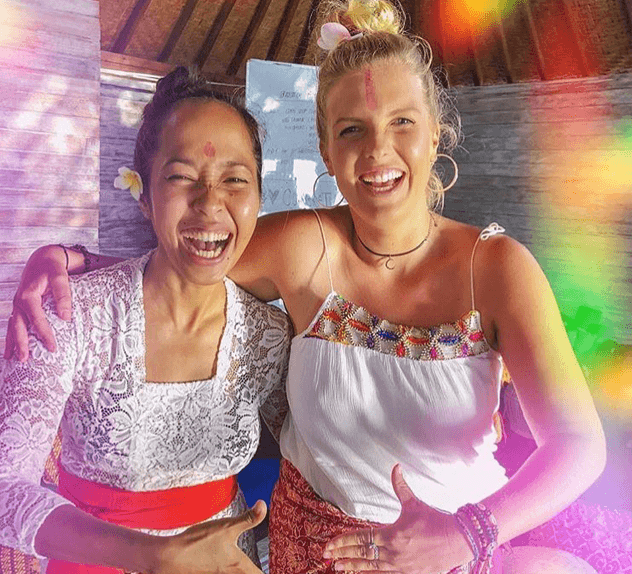 The Visa required for the training is the 30 day tourist visa which you can pay for upon arrival into Bali ($35 US, payable in most currencies) Some countries are eligible for a free Visa – but be aware that if you chose this option you cannot extend your time in Bali beyond 30 days without leaving Indonesia. With extending the Visa for further travel time, you can apply and pay for an extended 30 days on your tourist visa while in Bali without having to leave the country, giving you a total of 60 days. We can help put you in touch with a Visa Agent in Bali, just let us know at the start of your training if you are planning to stay longer than 30 days and we will help arrange this for you. If you wish to extend the Visa you must not choose the free Visa Option – you must insist on paying the fee. Otherwise you will have to leave Bali to extend beyond 30 days! Always pay for the Visa if you want to extend. Please note: Santosha cannot supply sponsorship or other documentation for any Visa applications. Do I need malaria tablets in Bali? Bali is free from malaria. However anti malarials may be necessary if you are travelling to other parts of Indonesia, so please consult with your doctor beforehand. What vaccinations do I need for Bali? I've never travelled by myself before, will I be okay on my own? Fear and nervousness are common feelings (along with excitement!) that people experience in preparation for the training. The good news is that you are likely in the same boat as 99% of your classmates - the majority of our students are attending the course on their own. This means you'll instantly meet a great group of individuals who are just as keen to make new friends and support each other as you. Your guesthouse will be able to prearrange a airport pick-up for you, taking the stress out of arriving in a new country and finding you way to our course location. Once you are here you will be immersed in a community of caring and supportive teachers and yogis who will walk beside you at every step of the way. If you are used to US dollars, our course investment converts to approximately $2,150 US (or $2,000 US at our early bird rate - paid in full two months early). This makes our course one the most affordable on the market - we want to spread the joy of yoga, so are committed to ensuring the cost is as low as it can be while still providing a top quality training for our students. - For those on a budget, there are off-site options for as low as $25 AU per night which means 25 nights will come to around approx $625 AU. - Nice mid-range off-site options can be found for around $30 - $40 AU per night - approx $750 - $1,000 AU for 25 nights. - More luxurious off-site options can be found from $50 AU per night - approx $1,250 AU for 25 nights. Attend our Level 1 YTT 200-Hour course, and in the extremely unlikely event that by lunchtime on the second day, you feel that you do not want to complete the course OR you do not want to become a Yoga Teacher, we will refund your money minus the non-refundable BUT transferable deposit fee.